The Grand Circus Alaska 2010 is coming to Marbella on Friday September 3 until Tuesday September 7. 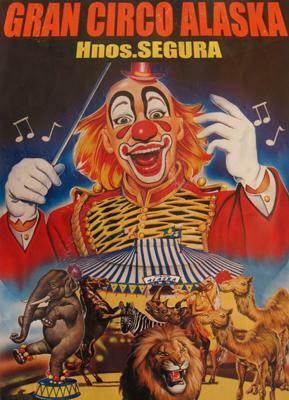 The circus will be held at the Marbella fairgrounds (Recinto Ferial) every day at 8:30pm. On Sunday September 5th there will be an extra show at 12:00pm. Not only will there be the typical circus acts, but the circus will also feature a special musical as well as Hello Kitty and Sponge Bob characters for the little ones. The Gran Circus Alaska will entertain the whole family with horses, ponies, camels, lamas, football playing dogs, trapeze artists, clowns, Bengal tigers and more. Tickets may be purchased at the door for 10 euros (adults and children). For more information call 680414445. We are telling everybody not to go to the circus! Its animal ABUSE! I saw them the other day passing by and even dogs were cramped in the cage with other animals! Everyone is passing the word NO IR AL CIRCO! ES ABUSO! Football Playing Dogs??!!!! THIS IS ANIMAL ABUSE! Its not normal football playing dogs! what are animals going through in training to learn these things. Probably Torture and Abuse. Animals should not be contained even for money! They should be FREE! And we know how much they hit elephants and burn them with cigarettes and torture them with kicks! DO NOTTT SUPPORT THE CIRCUS!